As a team Ali and Les have worked/sailed together many times and look forward to welcoming you to an adventure of a life time, whether it is a week’s relaxing sailing or time on the water improving your Sailing and Navigation skills in both warm and cold remote areas of the world. started dinghy sailing with her father at the age of seven, but it wasn’t until her late twenties she became interested in Yachts. After passing her RYA Yachtmaster qualification, Ali took up full time sailing and left the UK to go world cruising, sailing in both middle and high latitudes. As a RYA Instructor, and RYA Ocean Yachtmaster she returned to the UK to work for Clipper Ventures, skippering their 60ft and 68ft yachts on their corporate sailing days and training the crew for the round the world yacht race. The old salt has sailed for 50 years all around the world. He is an RYA Yachtmaster Instructor, Ocean and Yachtmaster Examiner. 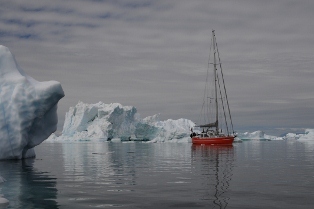 His experience extends to nearly 200,000 miles with yachts of all sizes, in both blue waters of the Caribbean and Pacific also the high latitudes of Iceland, Chile and Cape Horn. As well as several years in the Merchant Navy, he also ran a sailing school in North Wales for six years. I have been very interested to read of your exploits in 2013 and I send my best wishes to you both for the new year. Sea. The topping lift is never too tight!